Good news from Mark Swagerman at De Valk in Holland that he's closed on the sale of the 29m Princess motor yacht Dancing Queen to an American client, with Dean Anthony at Allied Marine acting for the buyer. Launched in 2011, Dancing Queen was the first Princess 95 to be fitted with MTU 2000M94 2,637hp diesel engines which, with her deep V hull, give her a cruising speed of 22 knots and a maximum speed of 30 knots. 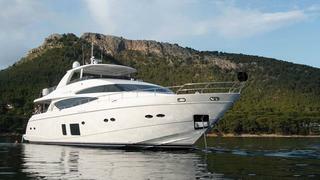 Accommodation is for eight guests in four staterooms including a full beam master suite, all en suite. The new owner is taking Dancing Queen to the US where she will be made suitable for 110V/60Hz power provision. Dancing Queen was asking €4.2 million.